Home / Blog / Cockroaches vs. Beetles – Which one is in your home? What’s the difference between the beetle and cockroach? 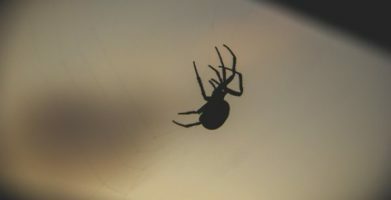 Homeowners would be less than enthused to find either of these two insects in or around their home. While neither are a house guest you want to welcome, it’s good to know the difference between the two to understand how to best rid your home of them. Learn more about the differences of beetles vs. cockroaches here. Cockroaches appear to have hard shells on the back of their bodies, when in fact the shell is more of a papery, leather texture, not solid at all. The shell is there to protect the wings from destruction. In some cockroach species, the males possess a double set of wings while the females do not possess wings at all. Cockroaches have six legs and not all can fly. Males and females differ in color from a reddish to brownish. The head of a cockroach contains large eyes and long antennas. An adult cockroach can measure from 1-2 inches in length. With over 3,500 identified species of cockroaches, roughly 10 of those are considered a pest to the household. The diet of a cockroach leaves little to the imagination — they will eat almost anything — including meats, sweets and starches, skin, hair, paper, and any organism dead or alive. Nothing is off limits to a cockroach. 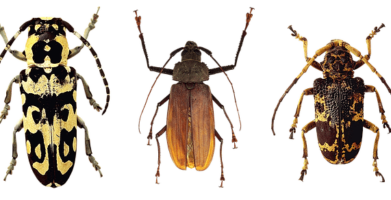 Most beetles possess two sets of wings, with the stiff, outer set used to protect the inside wings which are used for flying. Beetles have six legs and not all beetles can fly. With 400,000 different species of beetles, they all have a different appearance. Their sizes range from 6 inches in length all the way down to 1/16th of an inch. Most beetles are vibrant in color and very pretty—like the ladybug—while others are black or brown. Beetles can be a problem in the household, and can cause significant damage to agriculture, forestry and horticulture. The beetles diet depends on the type of beetle, but most will eat leaves, wood, seeds or carpet, while others may eat fungus or dung. Here’s a list of the most common types of beetles you will find in a household. 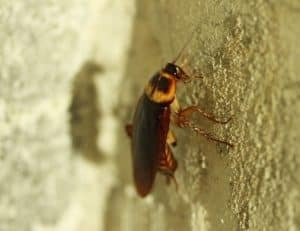 Cockroaches and beetles can cause destruction to your home or property. Cockroaches, of any stage, can carry and spread bacteria to you and your family. Their saliva and waste can contaminate your food, which can result in food poisoning and cause infections. Studies show that the cockroach may harbor viruses and bacteria such as salmonella, staphylococcus and the polio virus. Cockroaches can also cause allergies, depending on the level of infestation. Roaches primarily feed on starchy items but have been known to consume whatever is edible to them. They will find cereals and like products, as well as anything that is left out, to eat in your home. Larger cockroaches will damage paper products and glue, such as book bindings, and have eaten wallpaper. Most destruction caused by beetles is from their larvae. Larvae could be found in the home or other structures containing wood or carpet. The wood-boring beetle can live in wood up to 10 years, without any obvious signs. Once you have spotted a full-grown beetle in your home, it is probably too late to prevent any damage. Damage caused by carpet beetles is often mistaken for a clothes moths doing. Because beetles have mandibles, or two hard “teeth” in the front of their mouth, they are able to chew through leather, carpet and any type of cloth, even dead organisms, more than that of a cloths moth. 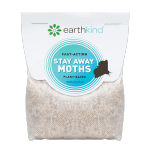 An adult beetle will feed on plant-based fibers in gardens and around the home, eating light-colored petals. While beetles do not spread disease, if left untreated, they and their larvae can cause excessive and expensive problems to your home and property. How do you know if you have a beetle or roach problem in your home? 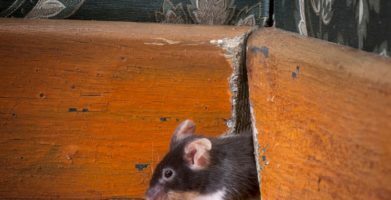 The larvae of beetles can be found in hidden and undisturbed areas, such as behind baseboards, under floorboards and under heavy objects like furniture. Some beetles find their way into your home through plant clippings and will stay close to their natural habitat. You can find them around flowers in pots or floral arrangements. Other beetles will be found around fibers like cloth or leather, seat cushions, furs or hides. 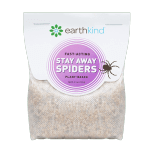 You will most often find a beetle, or beetles, in your pantry or around your kitchen and in drawers. Much like beetles, cockroaches will probably not be seen until there is an infestation. Because they are nocturnal, cockroaches prefer to seek a food source at night. Cockroaches have also been known to cause a musty odor — the more apparent the odor, the bigger the problem. Roaches will leave behind feces that resemble coffee grounds or specks of pepper. As the roach gets bigger, the waste will appear to be more like an oval pellet. If you spot a large amount of cockroach feces, you have a big problem on your hands. Cockroaches can be eliminated by taking away their food supply. Keep surfaces clean of extra food waste and store pantry food in air tight containers. You should also keep your garbage locked and air tight. Patch up any openings that roaches could be using to gain entrance, such as window cracks, cracks in door frames, etc. Natural repellents, like bay leaves, cucumber slices and garlic have been used to rid areas of cockroaches. 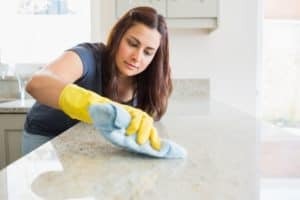 By placing them on counter tops, in pantries, or wherever you are experiencing a cockroach problem, you will leave your home smelling fresh while getting rid of the pesky roaches. Although the beetle may not transfer a disease to you or your family, they can cause quite a problem in the home. The best, and most safe way to rid your home of beetles is to use Stay Away® Beetles. 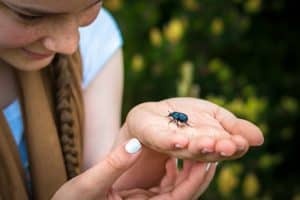 Beetles may find their way into your home for different reasons — they may be seeking shelter, or they may catch a ride on something that is carried into your home. Stay Away® Beetles is used by placing a pouch near any opening in which a beetle can enter—a door, a window, a crack in foundation, etc. The natural rosemary scent will ward off the beetle, as it’s not as pleasant to them as it is to us. The product will need to be replaced as the scent diminishes, after about 30-60 days. Homeowners would be less than enthused to find either of these two insects in or around their home. While neither are a house guest you want to welcome, it's good to know the difference between the two to understand how to best rid your home of them. Learn more about the differences of beetles vs. cockroaches here. With 400,000 different species of beetles, they all have a different appearance. Their sizes range from 6 inches in length all the way down to 1/16th of an inch. Most beetles are vibrant in color and very pretty—like the ladybug—while others are black or brown. Beetles can be a problem in the household, and can cause significant damage to agriculture, forestry and horticulture. The beetles diet depends on the type of beetle, but most will eat leaves, wood, seeds or carpet, while others may eat fungus or dung. Here's a list of the most common types of beetles you will find in a household. Cockroaches, of any stage, can carry and spread bacteria to you and your family. Their saliva and waste can contaminate your food, which can result in food poisoning and cause infections. Studies show that the cockroach may harbor viruses and bacteria such as salmonella, staphylococcus and the polio virus. Cockroaches can also cause allergies, depending on the level of infestation. Although the beetle may not transfer a disease to you or your family, they can cause quite a problem in the home. The best, and most safe way to rid your home of beetles is to use Stay Away® Beetles. Beetles may find their way into your home for different reasons — they may be seeking shelter, or they may catch a ride on something that is carried into your home. 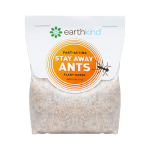 Stay Away® Beetles is used by placing a pouch near any opening in which a beetle can enter—a door, a window, a crack in foundation, etc. The natural rosemary scent will ward off the beetle, as it's not as pleasant to them as it is to us. The product will need to be replaced as the scent diminishes, after about 30-60 days. string(52) "Cockroaches vs. Beetles - Which one is in your home?"